Recognizing the need for affordable housing for veterans, their spouses and widows, five Branches of the Royal Canadian Legion in the Vancouver Area partnered to form the New Chelsea Society, one of the first Legion Housing Societies in Canada, in 1952. The original five Legion Branches included: South Vancouver Br. #16, Collingwood Br. #48, Lord Nelson Br. #68, Grandview Br. #179 and Hastings East Br. #185. Each branch contributed funding, eventually doubled by various levels of government. A plot of land was purchased on East 52nd Avenue near Fraser Street in Vancouver. 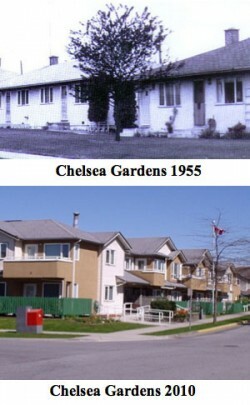 The Society’s first housing project, consisting of 22 cottages, opened in 1955. At that time, the rent was $19.50/mo for a single and $24.50/mo for a couple. The New Chelsea Society is named after a facility on the banks of the Thames River in England that provided housing for World War I and Boer War veterans. The Society was incorporated under the Societies Act of British Columbia as a non-profit organization on February 20, 1957. Its mandate fulfilled the original vision of the founders, to provide low-cost housing for veterans, and their spouses and widows. The Society has expanded its mandate over the years as more properties were acquired and more Legion Branches became members. Today, New Chelsea Society is a registered charity that represents 22 Legion Branches in two zones. Its expanded mandate is to provide low-cost, specialized housing in the lower mainland for a range of residents, including seniors, families and people with disabilities. With the addition of Winch House, the Society also provides temporary housing for Canadian Forces members, veterans and emergency first responders who have been injured and need a welcoming place to heal. We continue to serve and grow our organization in keeping with the first principles and mission of our founders, helping create close-knit and affordable communities for our tenants.